Life in Costa Rica is pura vida – literally translated as good life – but with many more layers of meaning. I’ll try to give you some sense of it, but for pura vida to truly be understood, it should be experienced so I invite you to join me in Costa Rica. In the United States I wake to the sounds of suburbia. Winter brings very short days in the northern states, so waking in the dark is typical. In Costa Rica I awaken to the sounds of nature. A symphony of animals calling to each other tells me the solar cycle is about to renew. In the very faint light of early dawn, birds softly call. 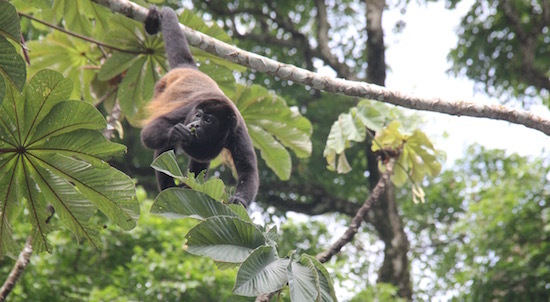 As the sky brightens toucans are joined by the wake up call of howler monkeys. I LOVE being part of the rhythm of nature. As the rain forest plays it’s morning tune, the sky is painted in beautiful pastel tones. I awaken slowly to the new day. I awaken feeling refreshed. I awaken to my true self. I awaken to a delicious morning cup of coffee! Costa Rica produces some of the best coffee in the world. If you love coffee like I do (hint: so does BKS Iyengar) it’s a divine treat to enjoy a cup of pura vida coffee in the quiet of the new dawn. A walk on the waters edge as the sun rises over the ocean is a beautiful way to begin each day. Some mornings I have a walking meditation on the beach and then do my yoga practice. Other mornings, I do the reverse. I call this a ‘vacation decision’ even though I’m not actually vacationing. It just feels that way. Everyday! In Costa Rica I can practice yoga without electronic music. One of the greatest gifts of yoga is that it connects us with our nature. My yoga practices always seem to be a little longer when surrounded by real nature like the rain forest. As the cool morning air turns warm I know it’s time for breakfast. You’ve already heard me say the food is better in Costa Rica, and it is! Papayas are the color they were meant to be; rich with flavor and health for your body. Fresh mangoes and pineapple are all grown locally – and best of all – free of chemicals. Then there are the eggs! 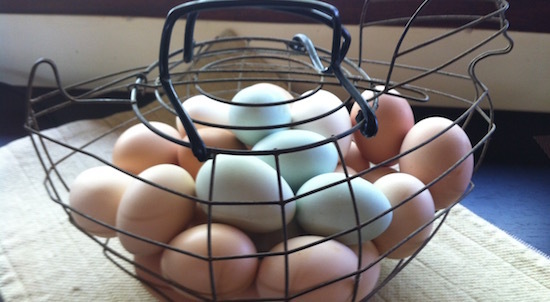 I never knew eggs could taste the way they do when they’re fresh from truly free-range chickens – just down the road. And don’t even get me started about the fresh baked bread. I feel especially healthy in Costa Rica, and I know spending time there has helped my face show a few less years than my age. Costa Rica has taught me not only to be present, but to get out of my head and back into my heart. My yoga teacher would say over and over again, “yoga is the undoing.” My days in Costa Rica are a natural undoing, especially my mornings. In the U.S. we “work-out” but in Costa Rica we walk, we bike, we move from one moment to the next. Life is simply healthier just by LIVING and the morning is just the beginning for me. 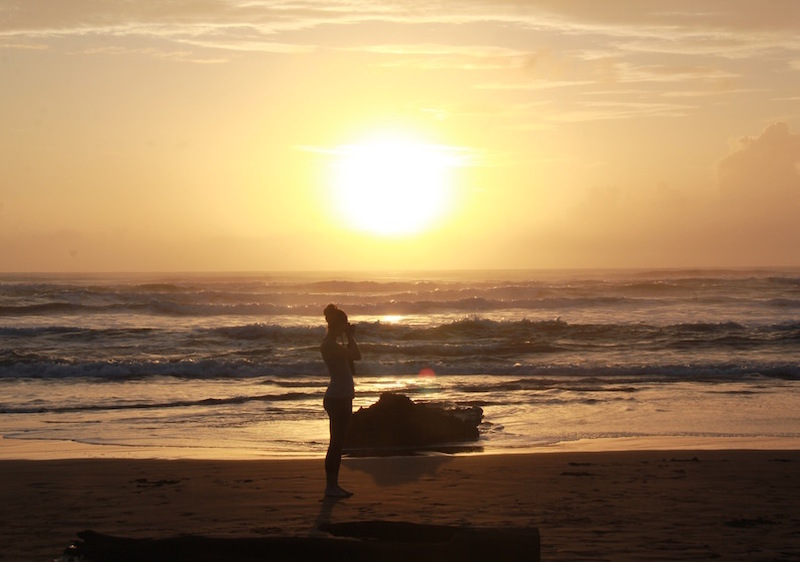 In Costa Rica I can be a part of nature, quietly existing with life’s rhythms, from sunrise to sunset. Closer to my true nature. Learning to appreciate this is part of understanding what we’re all about. And maybe, in this simple yet profound understanding, we become more aware of what we’re all about in this great big beautiful world. Or maybe it’s just me (but I doubt it). How do you find yourself each morning? Great article Marianne! I aspire often to live this same commitment and mentality here in Portland, OR. Everyday I do my best to connect with community, bike or walk, eat simple local foods including eggs from neighbors, engage with my environment in simple ways, and, of course, to experience the abundant wealth of diverse yoga offerings here in Stumptown! Can’t wait to share some of this special Costa Rican pura vida with you soon!